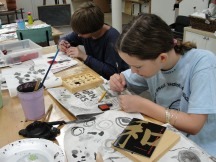 Activities: Excellent for young beginners who don’t have much painting and drawing experience, this camp combines the two fun things. You will learn how to use basic shapes to draw your favorite animals, how to create visual distance for the places where you would like them to be; then work with color mixing, washes and brush strokes to create colorful pictures one after another! 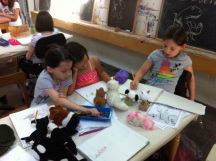 Materials: Campers need to bring their own sketchpads (9”x12”, spiral bound, at least 60lb); the studio will provide all the rest needed materials. 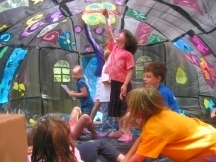 Choosing from a wide variety of themes, campers will learn basic color-mixing skills, compositional ideas, and painting techniques. 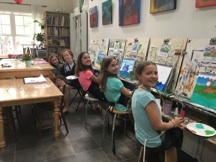 New campers will paint 2-3 paintings step by step under guidance; returning campers are free to depict their favorite subjects and receive individual feedback. 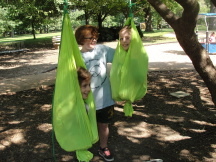 All campers can be expected to bring home 2 to 4 ready-to-hang paintings. 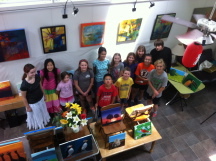 Bring your family and friends to the studio to enjoy our very own art show on Friday! Materials: Campers need to bring at least four stretched canvases (any size between 11"x14" to 16"x 20"). The studio will supply all the rest painting materials. Activities: This camp combines all the fun things together - all the activities ask for your imagination, creativity and skillful hand. Not only will we draw, paint and cartooning, but we will also make critter cut-ups, paper-weaving fish, wirework and other hands-on projects! Materials: All materials provided by the art studio. 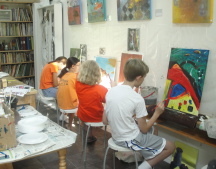 Activities: This camp will start you on a journey to one of the most challenging painting mediums. We will make it fun and easy to explore the many interesting watercolor painting techniques, and everyone will be able to create landscapes like sunsets, snow mountains, flower fields and underwater scenes, etc. 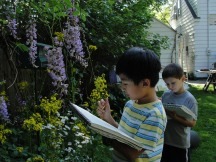 If weather permits, we will spend sometime painting outside at the beautiful studio garden! 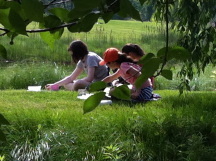 Materials: Campers need to bring their own watercolor pads (140 lb, 9”x12”, spiral bound please) and paints (I prefer Reeves Watercolor Paint Set - set of 12; siblings can share one set of paints). Please add $20 if you would like the studio to prepare these materials for you. Activities and Materials: Same as Arcylic Painting 1. 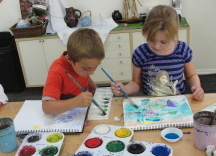 Returning campers are welcome to make new paintings and build on their painting skills. Camp programs will be announced via email to those who are on the mailing list. Please feel free to ask to be added to the list anytime. 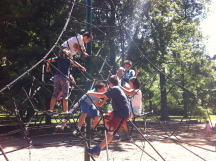 Camps tend to fill up quickly; a waiting list will be created once a camp is full. Please email Ms. Nian at nianart@gmail.com to reserve a spot (or check space availability) first before sending any payment. Applications will be processed in the order they are received.